Home / Diet & Nutrition / Is coconut oil good for you? Coconut oil—natural, vegan and delicious smelling. But is it actually good for you? Research from the American Heart Association (AHA) shows nutritionally, about 82 percent of the fat in coconut oil is saturated, which far exceeds butter (63 percent), beef fat (50 percent) and pork lard (39 percent), all of which are often considered unhealthy fat options. Coconut oil differs from other saturated options as it is a medium-chain triglyceride, as compared to long-chain triglycerides found in other saturated fats. The way coconut oil is metabolized is different, as it goes straight to the liver and is broken down for energy, unlike other fats, and may boost metabolic rate. The evidence supporting coconut oil for increased metabolic rate and weight loss has not been proven yet. Consumption of saturated fats in diet raises LDL (bad cholesterol) in the blood. 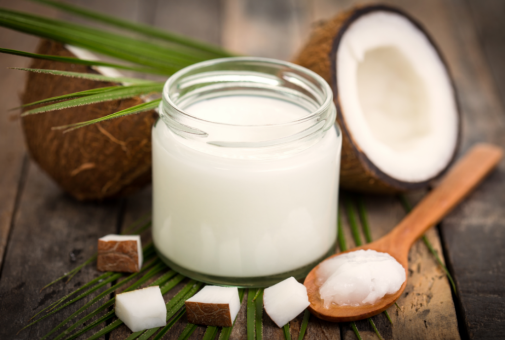 Researchers from the AHA reviewed data on saturated fat, showing coconut oil increased LDL cholesterol in each of the seven controlled trials. Eating coconut oil may also help raise levels of HDL (good cholesterol) in the body. The effect on cholesterol by eating coconut may seem neutral, but eating too much coconut oil for its cholesterol-lowering qualities may not be wise, according to Jain. The AHA recommends eating no more than six percent of your total caloric intake from saturated fat. Aim for oils with high levels of monounsaturated or polyunsaturated fats. Fats like olive oil, nuts and avocados are good options. “It does not mean that you absolutely cannot use coconut oil. As long as you are not overdoing it and are keeping your overall consumption of saturated fats in check, you can replace part of total saturated fat intake with coconut oil,” says Jain.